In the spring of 1940 the Soviet NKVD murdered around 25,000 Polish prisoners of war. They were shot on the orders of Soviet leader Stalin and head of the Soviet Secret Police (NKVD) Beria. After the Soviet Union invaded Poland on 17 September 1939 they sent captured Polish army officers to prison camps in the Soviet Union at Kozelsk, Ostashkov and Starobelsk. On 5 March 1940 Stalin signed the execution order approving the murder of 25,700 Polish prisoners of war. During April and May 1940 the Polish prisoners were gradually taken from the prison camps, shot and buried in mass graves. The mass graves were first discovered in the spring of 1943 after German forces invaded the Soviet Union. The first burial site to be discovered was the one at Katyn forest. 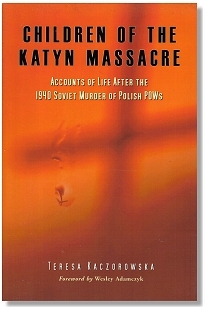 The murder of all the Polish officers has come to be known as the Katyn massacre. The Soviet Union denied all responsibility for the murders and blamed them on Nazi Germany. It was not until 1990 that Russian leader Mikhail Gorbachev admitted that the Soviet NKVD had been responsible. The book contains 18 reports, based on personal interviews, describing the fates of the children of Polish officers. The name of the Polish officer concerned is shown after the chapter titles listed below. Publisher - Published 2006 by McFarland & company, North Carolina, USA. Extracts from the book can be read at Google Books. This page was added on 15 August 2009.